Cao Fei sets a record price for virtual art? Chinese artist Cao Fei has sold a piece of virtual art in Second Life-the online, avatar-based world-for $100,000 to a private European collector during the opening of Art Positions on Wednesday, The Art Newspaper has learned. The “unit” is one part of a virtual art world or “cultural platform” called RMB City that is being developed by Cao Fei over the next two years.Other units, many of which resemble well-known Chinese buildings, are on sale for between $80,000 and $120,000. The director of Vitamin Creative Space , ZhangWei, who represents the artist, says the variations in price do not correspond to size but to the “aura” or “fame” of the unit’s real-world equivalent. Several of the buildings are versions of famous landmarks. The gallery hopes to gain “investment’ in five more spaces during the fair, to raise the initial web design costs of the project.Digital plans for the virtual development have also been selling well. Cao Fei: virtually a record? 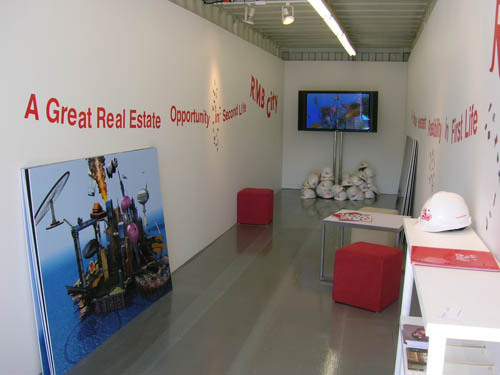 Vitamin Creative Space’s container at Art Positions is more estate agency than gallery. Pieces of virtual reality in the young Chinese artist Cao Fei’s RMB City, a new community within Second Life-the digital world “inhabited” by millions of residents-are on sale, billed as “A Great Real Estate Opportunity in Second Life” and “A Unique Investment Possibility in First Life”. The development aims to be a pioneering step in the creation of the “art world 2.0″ (the next generation of the art world online). 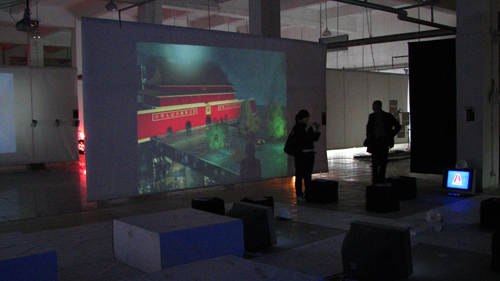 The virtual properties, which resemble iconic Chinese buildings such as Beijing’s Forbidden City, function as platforms for international art institutions, non-profit art organisations and one-off projects. When private collectors invest in a “unit” they gain two years “access” to the space and curatorial advice. At the end of this period you receive either documentation of its programme, which will be commissioned by Cao, or a multimedia work of art. Moving beyond traditional webpages, the close proximity and organisation of these virtual exhibition sites within this cutting- edge digital world will, the artist hopes, engender unprecedented “art structures”, cultural collaborations and information sharing. This project is a continuation of Cao’s artistic examination of the possibilities of Second Life. This summer the artist exhibited i.Mirror, a documentary film about her online love affair, in the China Tracy Pavilion project at the 52nd Venice Biennale. Plans for RMB City were presented as part of this cross-border biennale on urbanism and architecture, addressing the question: what makes a city “real” in the age of surreal development. RMB City project was presented at Art Basel Miami in a 13.5-meter- long truck container. Slogans and banners outside advertised “virtual real estate” as a means of promoting the RMB City concept in Second Life. Here visitors could witness the evolution of the project thus far: from video prototype to Second Life construction site to RL (real-life) promotion of virtual city development.